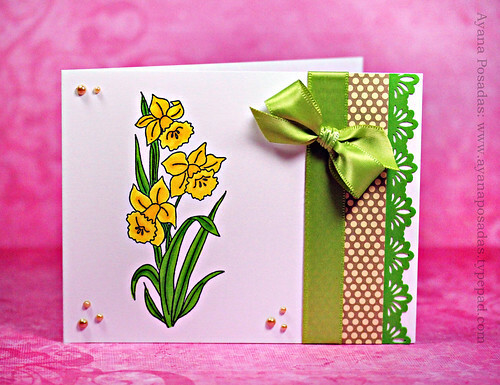 NOTE: If you are here for the Lily Pad Cards blog hop, please scroll down or click HERE for my post. Hi Everyone!.... This post is actually quite different from most of my other previous posts. I don't have a card or a creative project to share today. I just wanted to take some time to catch up on a few things that I have been meaning to mention on my blog. I am sad to say that I recently decided to step down from the Repeat Impressions design team. My reason for making this decision was not because I did not enjoy my time with the team. I truly had a wonderful experience with them. However, unfortunately, due to work and school and a few other events in my life right now, I have just become increasingly busy lately, and I have started to feel a bit overwhelmed and "stretched too thin" with some of my commitments. This was a hard decision for me to make, because I truly do LOVE working with Repeat Impressons and the talented and sweet group of ladies on the DT. I am going to miss it all very much! But of course, I will continue to support them as much as possible. Yaayyy Jocelyn! Please send me an email with your home address so that I can get your prize shipped out to you as soon as possible. I am excited to announce that one of my very sweet blog friends, Jill Foster has chosen ME to be featured as her inspiration this week on her blog. If you aren't familiar with Jill's work: every week, she features a new artist on her blog and she makes up cards that are inspired by photos of their work. To say that this girl is talented would be an understatement. Her work is always AMAZING and I urge you all to check out her blog! You can view my featured posts on her blog this week by clicking HERE. 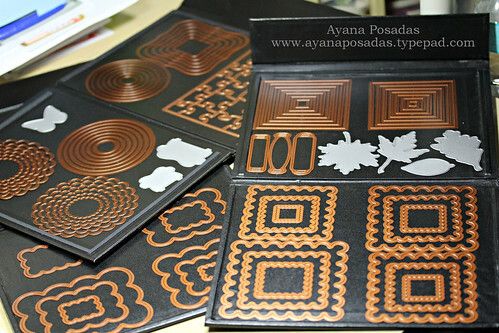 Also, I wanted to share a link to the Magnetic Storage Folders that were shown in my Scrapbox Tour Video. I received SO MANY emails regarding these folders. So I figured that there were probably even more people who didn't email me that still probably wanted to know where they could be found. Here is a picture of them below. I use them to store all of my metal dies. I had originally purchased them from my local stamp store. But, I was able to find them online, at this link ---> HERE. I hope this helps some of you. I'm currently in the process of moving, so I had gotten behind with responding to some of my emails. But I have since caught up with most of them. I didn't expect so many questions to come after my video. But I LOVE that so many of you showed interest and I really appreciate all of the sweet comments that were left. OK!.... So if you're still with me, You're Awesome! I know I tend to ramble a lot sometimes when I write. Thank you for taking the time to read this post, and please (as always) feel free to ask me any questions about anything, if you ever need to. I always love hearing from you guys! Hopefully I can get everything organized soon with my move, so I can then tackle my Google Reader (which is currently filled to the max) and get back into a more normal routine again. Designer's Choice Challenge- "Scenic Card"
NOTE: If you are here for the Lily Pad Cards blog hop, scroll down or click HERE for my post. Today is the first day of a NEW set of challenges that we are starting over on the Repeat Impressions blog. They will be called "Designer's Choice Challenge", which means that each of the DT members will have a chance to choose a theme for each of the upcoming challenges. This new set of challenges will be taking the place of our previous CASE challenges. 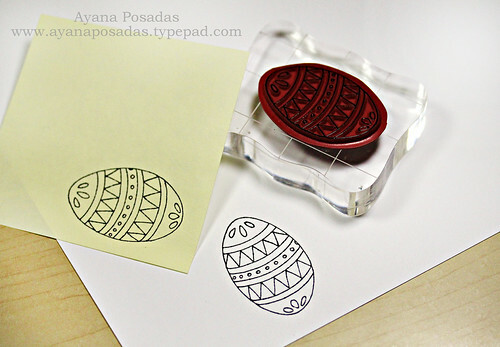 I masked off the "moon" by adhering a circle punch onto the cardstock before adding my various shades of blue ink. 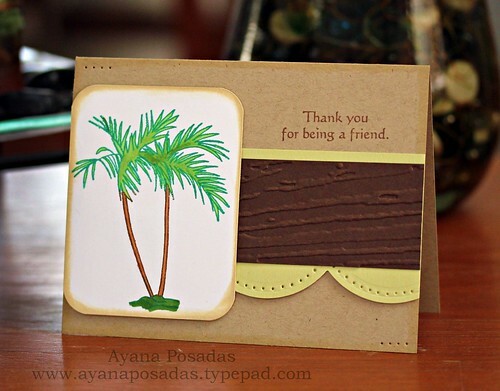 Then I simple stamped my palm trees image and colored it in using a thin black marker. I also drew on the ground at the bottom. I suppose it could be dirt or sand or anything you want it to be. Haha.... I'm still not even sure what I was going for. Well, I hope some of you will be inspired to play along in our very first "Designer's Choice Challenge". Be sure to stop by the Repeat Impressions blog for all of the details and also to check out more fun samples from the rest of the DT girls. Happy Monday Everyone! 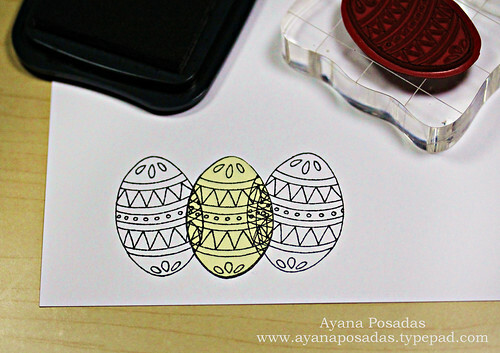 Today I'm sharing a quick and easy Easter Egg card on my blog, for the "Stamp of the Week" from Repeat Impressions. 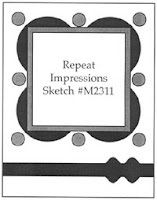 Step 1) Stamp your image twice: once on your main paper, and once on a post-it note (or any other thin sheet of paper) in order to make a "mask" for your image. Step 2) After cutting out your mask and layering it over your image, stamp your image again overlapping the mask, in order to give the look of "dimension". Super simple and fun to do! I'm sure many of you are already experts in masking, but for those of you that might have trouble with it, I hope this quick tutorial was able to help you out. 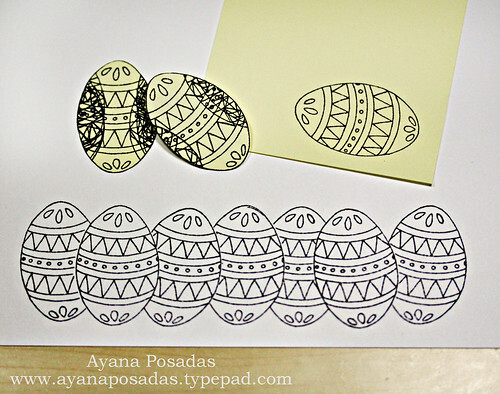 Optional Step) To add even more dimension to your focal point, you can simply cut out additional masks and continue stamping over them (as shown in the row of eggs above). 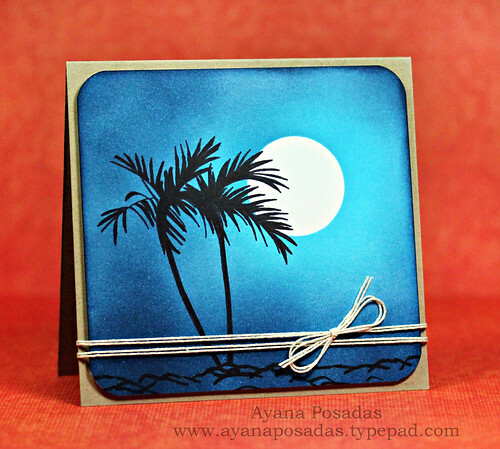 Be sure to stop by the Repeat Impressions blog today for more details on the Stamp of the Week image and also to check out the fabulous creations from the rest of the DT girls. For those of you who are not familiar with Wendy, she is the owner of Repeat Impressions and she is so super sweet and talented, and very hard-working. HAPPY BIRTHDAY Wendy!!!! The girls and I, from the RI design team, are all celebrating Wendy's day by posting a birthday card that we each made for her. 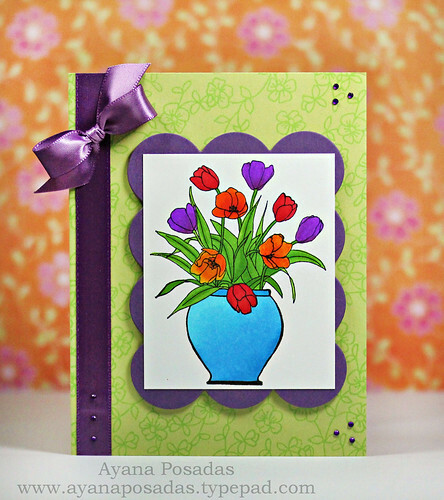 Although, mine does not have an actual sentiment on it, I still wanted to use the "Vase of Tulips" image on my card, because it's one of my most favorite designs that Wendy has created. So I thought I would show her how much I love it by putting it on a card for her. If you get a chance, please stop by the Repeat Impressions blog today, in order to wish Wendy a very Happy Birthday, because she definitely deserves it! Thanks so much for reading. Hope you all have a fabulous day! RI Sketch Challenge: "Fall Tree"
Second Post for the day. Please scroll down for my DeNami Easter card. 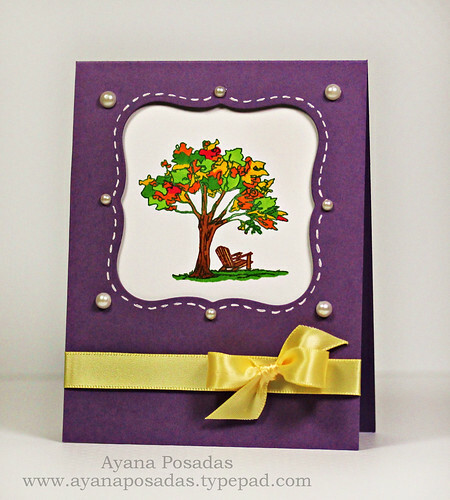 I hope you'll take a moment to check out the other inspiration cards on the Repeat Impressions blog too. Hopefully I've inspired some of you to play along! RI CASE Challenge- "Thank You For Being A Friend"
I have another card to share with you all, for the latest Repeat Impressions CASE Challenge. 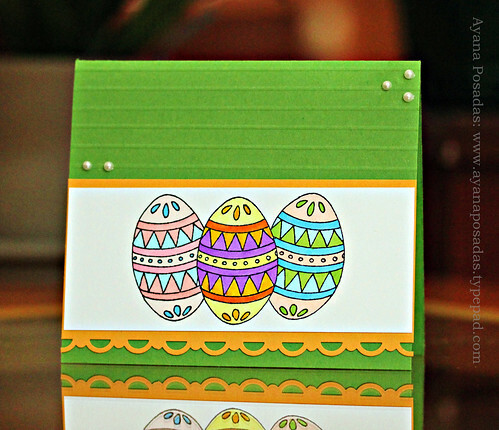 This week's case card was created by our newest DT member, Karen. Hope you'll get a chance to play along! 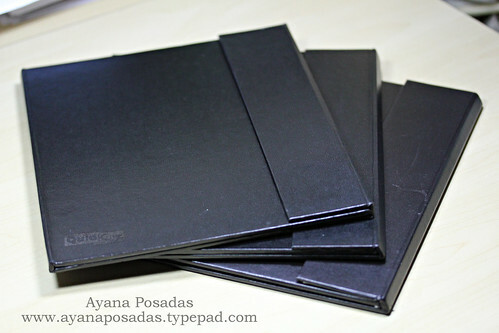 Head on over to the Repeat Impressions blog for more details and some fun inspiration samples too. Just sharing another great "Stamp of the Week" with you all, from Repeat Impressions. 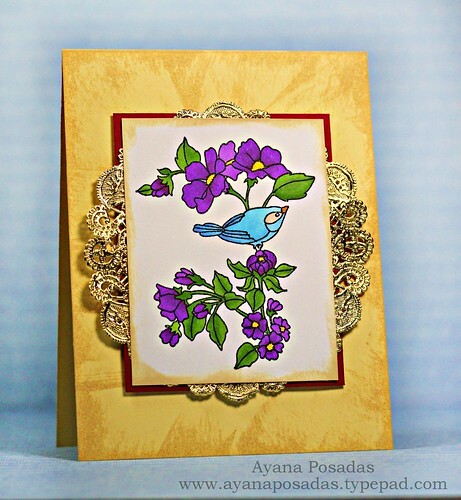 This week we are showcasing this "Bird & Blossoms" image (shown above). I hope you'll take the chance to stop by the RI Blog and check out the other DT samples too. Today is a special day for Repeat Impressions because they are celebrating their "One Year Blog Anniversary"! Yay! I'm so proud of Wendy & Bill for their success throughout this past year, and I am also very honored to be a part of such a beautiful group of ladies on the design team. We have all contributed to the RI blog since the beginnning, so it's very exciting for each of us to be able help celebrate their first Blogaversary. In honor of today, we have each created some fun projects to showcase on our blogs. 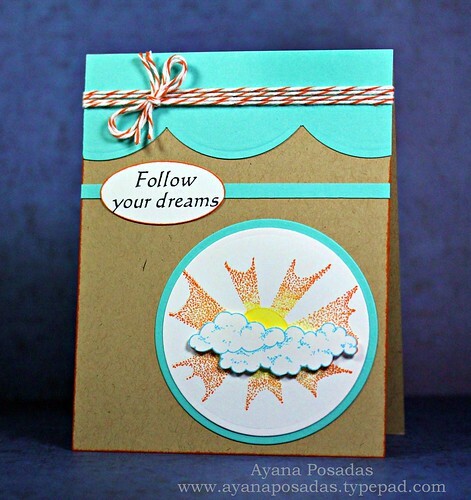 I chose to use the "Follow Your Dreams" sentiment on my card, shown above, because that is exactly what Wendy and Bill have done in order to create and maintain the Repeat Impressions company since the beginning. 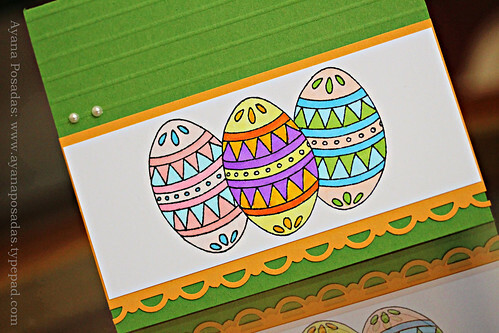 I hope you'll take the time to celebrate with us and hop on over to each of the DT blogs. Be sure to leave comments on each of the blogs too, in order to be entered into a drawing for some fun prizes. You can also have 3 more chances at winning if you create a blogaversary card and upload it to the Repeat Impressions blog. You can find out all of the details by clicking here. 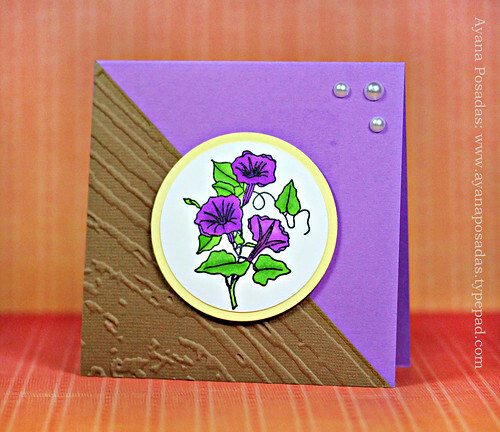 RI Sketch Challenge using "Morning Glories"
Happy Wednesday Everyone!... 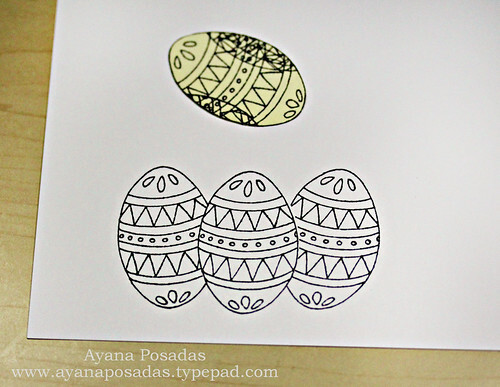 There's a new fun Sketch Challenge being featured over on the Repeat Impressions blog today! Be sure to head on over there to check out the details and also to see more fun samples from the talented DT girls. I hope some of you will get a chance to play along! Oh, and if you haven't gotten a chance to check out my current giveaway yet, you can find it by clicking HERE. It's time for another CASE Challenge over on the Repeat Impressions blog. This week's case card has a pretty simple, yet fun layout. I think it can be interpreted to be both a horizontal or even a vertical card, if you wish. 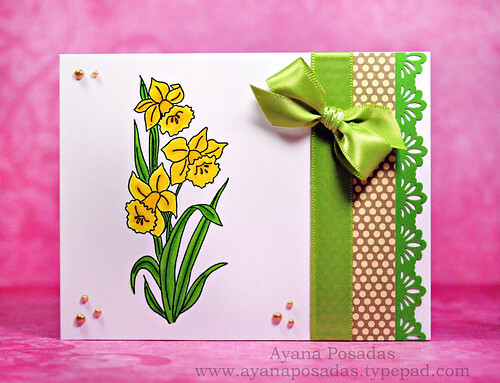 As you can see, I chose to keep mine horizontal, and I used the "Daffodils" image and then added some fun embellishments. Hope some of you get inspired to play along! Be sure to check out the Repeat Impressions blog for all the details. Oh, and before I go.... in case you haven't heard, there's some fun news over on the Lawnscaping Challenge blog right now. You can read all about it HERE!